If you want to pursue magic, you’ll want to learn some simple tricks. 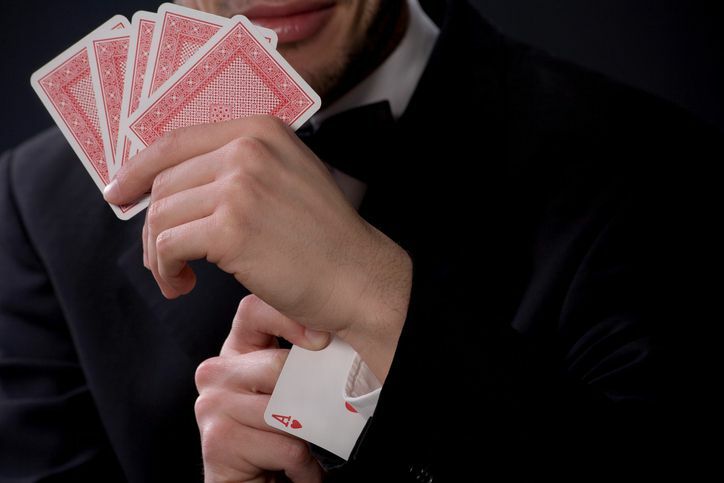 Here at Magic & Illusion, we explain lots of tricks that use everyday, common, household materials and require no complicated sleight-of-hand. We also offer clear, step-by-step instructions so you may quickly learn the tricks and perform them for your friends. These tricks have been specifically selected for beginners. Here's an age-old trick that you can do anytime, anywhere. In an instant, you seemingly pull your thumb apart and then put it back together again. If you’re an uncle or grandpa, you almost have to learn this trick to tease the kids. And if you want to truly torment a professional magician, show this trick and ask him if he knows how you did it. This classic trick is great for young kids and just about every magician has played with it. In the effect, a pair of paper clips are attached to a dollar bill. After pulling the ends of the dollar bill, the paper clips link and jump from the dollar. The spectator selects a card and places it back into the deck. After placing the deck behind your back and bringing it out again, the selected card is shown to have reversed itself in the deck. This well-known sequence allows a person to discover a spectator's card simply by dealing cards. Simply follow the instructions. If you like, you may adapt this sequence to work with a pack of 21-cards. A rubber band mysteriously jumps from your pinkie and ring fingers to the first and middle fingers of the same hand and then back again. All you need is a rubberband. You mysteriously locate four aces from a shuffled deck. This one is easy to perform. All you need is a deck of cards and a jacket that has an inner pocket. To view all of the easy magic tricks at Magic and Illusion, please visit our library. Check often because we add new tricks almost weekly.